This work presents the structure, distribution and semantic interpretation of quantificational expressions in languages from diverse language families and typological profiles. The current volume pays special attention to underrepresented languages of different status and endangerment level. Languages covered include American and Russian Sign Languages, and sixteen spoken languages from Africa, Australia, Papua, the Americas, and different parts of Asia. The articles respond to a questionnaire the editors constructed to enable detailed crosslinguistic comparison of numerous features. They offer comparable information on semantic classes of quantifiers (generalized existential, generalized universal, proportional, partitive), syntactically complex quantifiers (intensive modification, Boolean compounds, exception phrases, etc. ), and several more specific issues such as quantifier scope ambiguities, floating quantifiers, and binary (type 2) quantifiers. The book is intended for semanticists, logicians interested in quantification in natural language, and general linguists as articles are meant to be descriptive and theory independent. 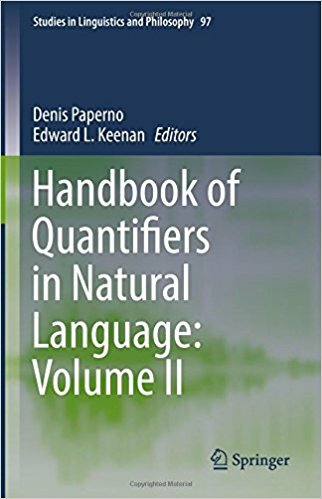 The book continues and expands the coverage of the Handbook of Quantifiers in Natural Language (2012) by the same editors, and extends the earlier work in Matthewson (2008), Gil et al. (2013) and Bach et al (1995).